If you've just popped by for a pre-GW look of the captain rankings and missed two posts earlier this week I'd advise you to take some time to go and have a look I find them pretty educational, even I do say so myself. If you've followed this blog since Christmas you'll know how Sturridge shot to the top of the rankings on his move to Liverpool. He's a greedy so and so and likes nothing more than to put the ball in the back of the net. Good news for your fantasy team! Suarez actually edged out Sturridge in terms of statistical performance after a few fames together, and young Daniel lost his place in Liverpool's team. Suarez' appetite for self-destruction re-opened the door for Sturridge of course, and he has served himself up a banquet of goals since. He leads Captain Polls across other fantasy sites and tops these rankings too. 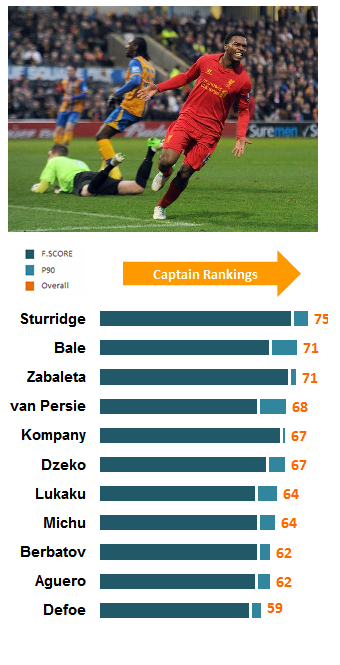 Bale too is going to be hotly captained, but you've got to fancy Sunderland as a tougher nut to crack than QPR. Watch out also for Michu. "...but you've got to fancy Sunderland as a tougher nut to crack than Sunderland." Hey, ur doing an awesome job on this site. I hv been regularly following ur site since gw 1 & it has helped me a lot. i especially liked ur captain ranking, match centre & projections. Hope u keep up the good work for next season too. Cheers ! appreciated! and what an amazing name you have! you can look fwd to bigger and better next season.